Death of Fr. Denis Cronin, Redemptorist, in Brazil, Dec. 12, 2012. The death occurred on December 12th in Brazil, of Fr. Denis Cronin, Redemptorist. Fr. Denis was born in Kiskeam in County Cork, in 1933. He had been part of the Irish Vice- Province of Fortaleza, in North East Brazil, since the early 1960′s, soon after the mission began there. Fr. Denis was greatly loved by every Redemptorist confrere who knew him, and by so many people among whom he ministered. Denis was one of God’s gentlemen. The following tribute was paid to him by his nephew, Michael Moynihan, T.D. Text of message received from Michael Moynihan T.D. (nephew of Fr. Denis), translated by Fr.Chris Hogg and read at the Mass. (To his family, he was always Fr. Den ). When Father Den first went to Brazil in 1961, it was seven years before he came first came back. Communications were not what they are now. It took about a month for a letter to arrive, but he still maintained contact throughout, and often he knew more of what was happening here in Ireland than we knew ourselves. His ministry was hugely successful both in Teresina and Fortaleza, and judging from reports from the funeral on Friday, there were huge crowds in attendance to testify to how popular and how loved he was. We on this side of the Atlantic, to a man, woman and child, tried to convince Father Den to retire to Ireland, but his heart was in Brazil. 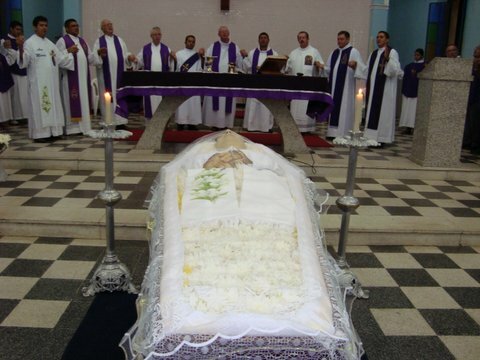 It was ironic that it was on a holiday in Teresina, which was a parish that he loved so well, that he passed away. His visits home every two years were as welcome as the flowers of May and the summers when he was around could not last long enough. Almost immediately on his arrival in his birthplace of Dromscarra, he started tending to his lawns and hedges, and within days of his arrival his hand could be seen all over the place. There were always huge clean ups before he arrived and everybody was involved. One of his most difficult trips across the Atlantic was when his twin died, and he didn’t know whether she was alive or dead. Father Den came home for what he said would be the last time a year and a half ago so we doubt he had many regrets. He fought the good fight, zealously kept the faith, and ultimately won the race. His guiding hand was gently felt on all our shoulders over the years. 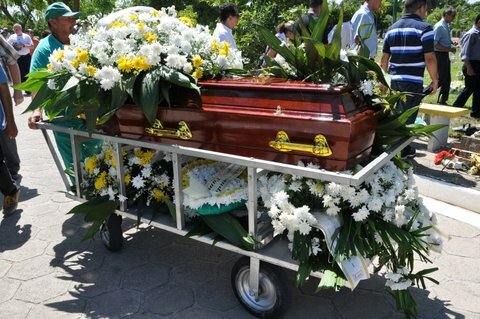 May the soft soil of Fortaleza, where he now rests, lay gently on him, and may heaven be his bed. Fr. 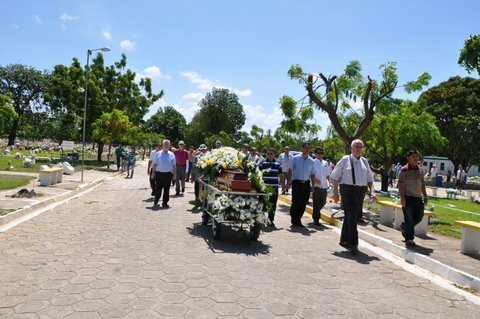 Denis was on a short holiday of one week, back to the city of Teresina, to the Redemptorist parish there, where he had worked as Parish Priest back in the late 60′s, and was greatly loved. He spent his last week visiting old friends, not knowing that this was his farewell to them. While there, he took ill during the night, was brought to hospital by Fr. Tadhg (Tiago) Herbert, and while in hospital he got two heart attacks and died. He was 79 years of age. There was a large funeral Mass for Fr. Denis in Teresina at 6am, and then the hearse left to travel the 700k to Fortaleza. The following are a couple of email describing the sequence of events. Message from Teresina, in State of Piaui, N. E. Brazil. This is to let you know that Fr. 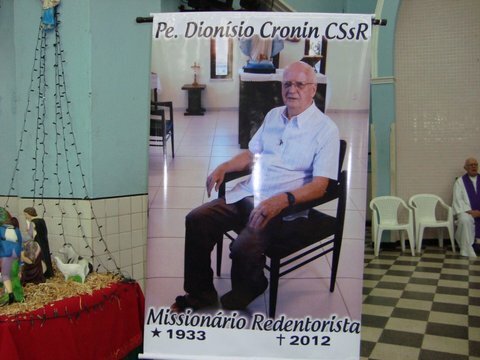 Denis Cronin died this morning in Teresina, Brazil. Denis’s community was in Fortaleza but he had gone to visit the confreres in Teresina. Last night he wasn’t feeling well and stayed up until 10.00pm, past his usual retiring time. About 3.00am he still didn’t feel well and came out and sat on a chair on the corridor. About 5.30am he awakened one of the confreres and at this time, as he had respiratory difficulties, Fr. Tadhg Herbert brought him to hospital. While in the hospital he had two heart attacks but efforts resuscitate him were not successful and he died. This Wednesday evening they will have a Mass for the happy repose of his soul in Teresina and tomorrow his remains will be taken to Fortaleza where the Funeral Mass will be celebrated on Friday followed by burial in Fortaleza. Yesterday at 6.00pm we received Denis remains in the parish church here in Teresina. At 7.00pm we had a Concelebrated Mass with confreres from Nazaria, Araioses and ourselves from Teresina. 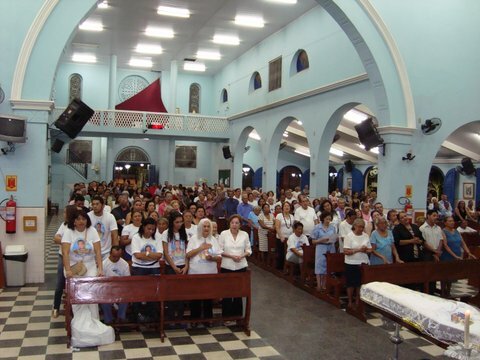 The church was full as Denis had been parish priest here in Teresina for a number of years in the late 60′s and 70′s. During that time he did a lot of work on the social front, building community centres and organizing skills and training programmes for young people. During the past week that he spent in Teresina he mentioned on a number of occasions that the happiest days of his life here in Brazil were spent in Teresina. During the past week he managed to visit a lot of his old friends. It does seem to all that he came back to Teresina these days to say his last farewell. The people prayed and sang all night in the church and we celebrated Mass again this morning at 6.00am. The remains were then sent on the journey back to Fortaleza. Fr Carlos Augusto is accompanying the remains. May our confrere rest in peace. Tadhg (Herbert). The body of Fr. Denis, accompanied by Fr. Carlos Augusto, was then taken by road (700kms) to Fortaleza. The body arrived about 5.00pm at the church of St. Raymond Nonato (our parish here in Fortaleza) to a waiting crowd and the confreres. Mass was celebrated at 7.00pm with fifteen confreres. Afterwards there was another night vigil with morning prayer at 8.00am. At 10.00am (Friday the 14th) Fr. Eridian the Vice Provincial presided with another twenty confreres, also theology students, and philosophy students. There was a large congregation present. Some of the confreres present at the Mass also said a few words and a few people came forward and spoke briefly about how much Fr. Denis had been to them and especially during the years of the dictatorship in Brazil. The ex-mayor of Fortaleza Maria Luiza spoke of Fr. Denis’s determination in the struggle for social rights for the people and his option for the poor. The Mass concluded with Fr. Peter Mc Carthy giving the final absolution. 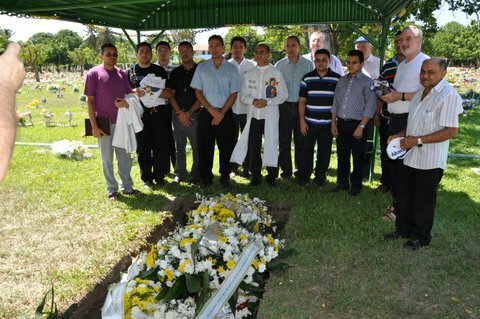 Two buses and a fleet of cars brought the confreres, friends to the Parque da Paz cemetery about thirty minutes drive. At the graveside hymns were sung and Fr. Albert McGettrick conducted the service. The coffin was lowered and cement slabs were placed over it. We all returned to lunch at the Central House. Next Tuesday (18th) at 10.30am there will be a visit by the confreres to the cemetery, followed by lunch at the Central House and Mass at 6.00pm in the church of St. Raymond. May God grant our confrere Denis happiness and peace in Heaven. Ar dheis Dé go raibh a anam dílis! Memorial Mass in Ireland: At 12.00 noon on Sunday (16th December) a Mass to celebrate the life of Fr. Denis was celebrated in the Church of the Sacred Heart, Kiskeam, Co. Cork. The celebrant was his fellow parishioner, Redemptorist confrere and fellow Brazilian missionary, Fr. Con Kenneally, now working in the Parish of the Assumption, in Ballyfermot, Dublin.